80s hair bands ruled the airwaves towards the end of that decade. Managing to somehow combine gallons of Aquanet, pounds of purple eyeshadow and undeniable masculinity, 80s hair bands turned music on its head when it appeared. To some fans, music has never been better. The term "hair bands" is used to describe both a musical genre and fashion sense that indelibly go together. The fashion borrowed a little bit from glam rock and a little bit from metal. Ripped shirts, lycra pants, ripped and tight jeans, leather jackets and bandanas were de rigueur for the boys, and anything short, tight, lacy, leather or barely there (or preferably all of the above) made up the fashion of choice for the ladies that loved them. The hair had to be long and as big as humanly possible, and a full face of pink and purple makeup was the norm for guys. The music, which emanated from the center of the hair band universe - Los Angeles - again combined elements of glam and metal, but they added a touch of pure pop. Some of the most recognizable chart hits from the late 80s came from hair bands. Think of the sound as pop metal. Though some metal fans object to having the word "metal" brought into the conversation at all, the elements are there: an emphasis on guitar solos and loud vocals. Although they didn't invent them, hair bands also get a lot of the credit for a now largely defunct style of song: the power ballad. Power ballads are love songs with an edge - the quintessential raise-your-lighter-at-the-show songs. Groups like Survivor, Journey and Air Supply were making power ballads before the hair bands came along, but hair bands really took the power ballad to new levels of success. The reign of hair bands didn't last long. They hit the scene with force in the late 80s and then were soundly trounced by grunge and the rise of 90s pop R&B. Their style of music remains influential, however, and there are still legions of dedicated fans that long for the days when hair ruled the waves. Poison was one of the poppiest of the hair bands, and also one of the most successful on the radio and MTV. They were the brains behind hits that still get rolled out of the vaults today, including Talk Dirty to Me and Nothing But a Good Time. 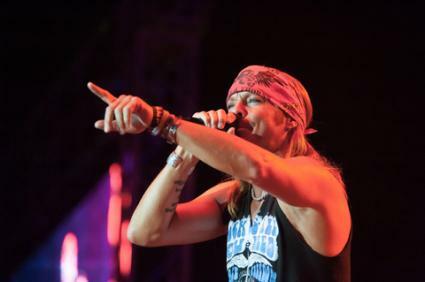 The band got a new lease on life when a new generation of fans got to know them through singer Bret Michaels' search for love on VH1's Rock of Love. RATT was one of the first hair bands to make an impact - the band actually formed in 1976. They were a little bit edgier and a lot less glam than Poison. Their best known hit is Round and Round. Warrant was one of the latest hair bands and managed to make their career stretch into the 1990s. Warrant had a way with power ballads and were behind such classics as Heaven and I Saw Red. Jani Lane, lead singer of Warrant, also made a VH1 appearance - this time on Celebrity Fit Club - but it didn't have the same effect for Warrant as Rock of Love had for Poison. Motley Crue straddled the line between the pop of Poison and the harder sounds of RATT. The band still tours successfully today and remains in the public spotlight, in no small part because of drummer Tommy Lee's relationship with Pamela Anderson. Motley Crue created hits such as Dr. Feelgood, Girls, Girls, Girls and Don't Go Away Mad (Just Go Away). Other bands that fall into the hair band category that deserve a mention include: Cinderella, Whitesnake, Winger, Great White, L.A. Guns and Tesla. Who did we miss? Leave us a comment and tell us about your favorite hair bands.